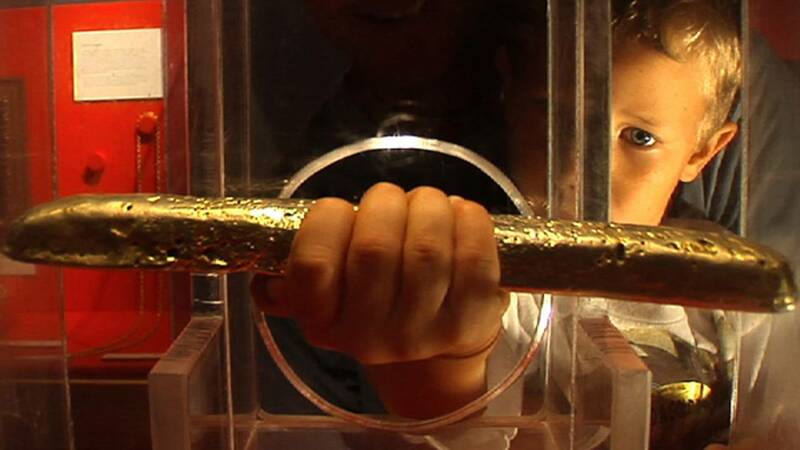 A boy picks up the gold bar in a photo taken before the theft. KEY WEST, Fla. - Federal authorities arrested two men Monday accused of stealing a 17th century gold bar in 2010 from a museum in Key West. Prosecutors with the Department of Justice said Richard Steven Johnson, 41, of Rio Linda, California, removed the gold bar from its display case at the Mel Fisher Maritime Heritage Museum on Aug. 18, 2010. Jarred Alexander Goldman, 32, of Palm Beach Gardens, acted as a lookout for Johnson, prosecutors said. The gold bar -- an artifact from a Spanish shipwreck -- has not been recovered. In 2010, museum officials valued the bar at $550,000. The museum's security camera captured the thieves at work, but the men remained at large for years. Prosecutors did not say what led to Johnson and Goldman's arrest. Before the heist, the museum had encouraged to visitors to pick up the 74.85-ounce bar to feel its heft. The bar had been on the display for more than 20 years, and the museum officials said more than 6 million visitors had lifted the bar. However, that unique set up may have helped the men carry out the theft. Police at the time of theft said the thief broke the display case -- made of bulletproof glass -- to extract the bar. Mel Fisher, who died in 1998, led the expedition that found the gold bar among other artifacts in 1980 while salvaging the wrecks of the Spanish galleons Atocha and Santa Margarita. Fisher founded the museum to display the treasures recovered from shipwrecks.